He'll create a web of fun as he splashes through puddles in the Western Chief™ Kids Creepy Crawls rain boots. Rubber upper features a large spider at the front. Pull-on design with two pull-handles. Round toe. Textile lining and footbed. Rubber outsole. Imported. Measurements: Weight: 14 oz Shaft: 6 in Product measurements were taken using size 9 Toddler, width M. Please note that measurements may vary by size. Weight of footwear is based on a single item, not a pair. 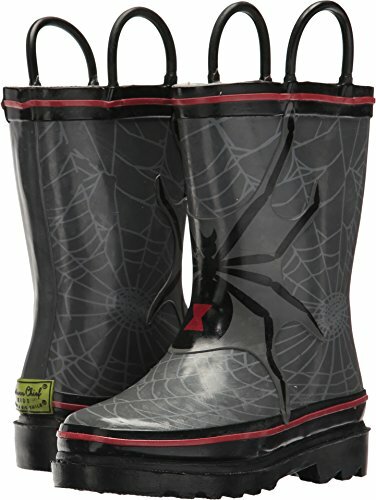 He'll create a web of fun as he splashes through puddles in the Western Chief™ Kids Creepy Crawls rain boots. Rubber upper features a large spider at the front. Pull-on design with two pull-handles. Textile lining and footbed. Rubber outsole. Imported. Measurements: Weight: 14 oz Shaft: 6 in Product measurements were taken using size 9 Toddler, width M. Please note that measurements may vary by size. Weight of footwear is based on a single item, not a pair.